Tire chemicals refer to various types of chemical which are utilized in the manufacturing process of tires. Tire chemicals enhance the durability, handling, resistance and grip of the tires. Various types of tire chemicals such as synthetic rubber, natural rubber, carbon black, crude oil and others offers optimal solutions to intensify durability, grip and other feature of tires. Global tire chemicals market is expected to grow at a steady CAGR over the forecast period 2017-2024. In terms of volume, tire market accounted for 2380 Million units in 2016. This has intensified the demand for tire chemicals all across the globe. Further, the global tire chemicals market is anticipated to exceed 43.5 Million tons in terms of volume by the end of 2024. The rising sale of automotive across the globe is envisioned to bolster the growth of global tire chemicals market in the next few years. 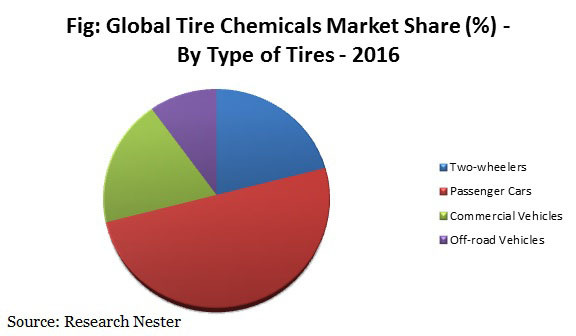 Geographically, Asia-Pacific accounted for the highest market share in terms of volume in the overall global tire chemicals market. This can be attributed towards various factors such as presence of automotive industries and large number of tire manufacturers in the region. However, oversupply of tire chemicals such as natural rubber and synthetic rubber in the region is predicted to decrease the growth of Asia-Pacific tire chemicals market. This excess supply of tire chemicals is declining the demand for tire chemicals. However, government involvement in Asia-Pacific countries is predicted to trigger the growth of tire chemicals market. For instance, Chinese government is encouraging Chinese tire manufacturers and associations through various set of standards and guidelines. Middle East & Africa region tire chemical market is anticipated to witness significant growth over the forecast period. Rising demand for automobiles and increasing purchasing power of the consumers is anticipated to supplement the growth of tire chemicals market in the region. Rise in the demand and sale of automotive is driving the growth of the tire market globally. According to Automotive Association - OICA, 69 Million new passenger cars and 24 Million commercial vehicles were registered in 2016 all over the world. Further, this number is expected to expand in the next few years which are likely to impel the demand for the tire chemicals. Additionally, high demand for replacement of tires is anticipated to escalate the growth of the tire chemicals market. Apart from this, high demand for durable and long lasting tires is envisioned to drive the global tire chemicals market during the forecast period. However, economic challenges such as volatility in the raw material price are anticipated to dampen the growth of the global tire market. Implementation of environmental protection laws and regulations is anticipated to inhibit the growth of global tire chemicals market.